All the comforts of home in a woodsy cabin where you can relax and enjoy your vacation. Base Camp is a cozy cabin located on a desirable stretch of Caribou Lake in Lutsen, MN. Base Camp is a 3 bedrooms and 1.5 bathroom private vacation rental home in Lutsen, MN. Enjoy the private seasonal dock. Caribou Lake is ideal for swimming, fishing, canoeing, kayaking, etc. Reconnect to what`s important and escape the hustle and bustle of the city and enjoy the beautiful night sky at Base Camp. The living room has large windows and a vaulted ceiling, with plenty of seating for everyone. Watch a DVD on the flat screen TV and turn on the gas burning The living room flows into the dining room area for a semi-open living area. There`s seating for 5 at the dining room table. The dining room is nestled in between the kitchen and the living room. The sliding glass doors from the dining room lead out to the spacious lake-facing deck. Enjoy the gas burning fireplace and deck furniture seasonal in the summer months. The L-shaped kitchen features a new stainless steel stove. The kitchen also has a new dishwasher- no need to hand wash dishes during your stay The kitchen is well stocked to prepare meals during your stay at Base Camp. The master bedroom, located on the lower level, has a Roku TV and attached half bathroom. The master bathroom has a king sized bed and plenty of closet space to unpack and enjoy your Caribou Lake vacation. The attached half bathroom has a large vanity- great for getting ready for your day. The two guest bedrooms are located on the second level. At the top of the stairs you will find a shelf with some fun games and other activities for spending time with family. The first guest bedroom has a queen bed as well as a TV with a DVD and VCR built-in. The second bedroom has a twin over twin bunk bed. Back on the main level, the main bathroom in the home features a shower/tub combo. There is also a nice vanity for getting ready for your day of exploring the North Shore. Coming for an extended stay No need to overpack, Base Camp has a new washer and dryer The spacious deck is great for grilling up some fresh-caught lake fish and dining out on a warm summer`s night. Enjoy great views of Caribou Lake from the deck while enjoying your morning coffee. Plenty of parking for up to 3 cars in on the street side of Base Camp. The lake side of Base Camp features the large deck. Enjoy the fire ring in the summer months, roasting marshmallows and sharing stories of your North Shore adventures. Base Camp is open year round and is a great winter destination with close proximity to snowmobile trails and just 5 miles from Lutsen Mountains Ski area. What a better way to spend your day than sitting on the edge of the dock and enjoying the views of Caribou Lake. Enjoy Hiking, Biking, Boating, Fishing and more at Base Camp, a cozy vacation rental home on popular Caribou Lake. 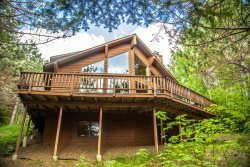 This beautiful, 2 level, 1,200 sq ft cabin sits on the shore of Caribou Lake in northern Minnesota in the town of Lutsen. A private dock, large deck, and wooded lot offer plenty of things to enjoy right at the cabin. Then cozy up by the gas fireplace or watch a movie after a long day of exploring the beautiful North Shore of Lake Superior. Base Camp is conveniently located near Lutsen Mountain Ski Hill, Superior National Golf Course, many Federal and State park trails, and the shores of Lake Superior are just minutes away. For a night out experience live music at Papa Charlie's, Lutsen Resort, or many of the dining options in Lutsen and Grand Marais. Once you visit this cabin you will want to make Base Camp your home base for many adventures to come. You don't have to go far, however, to find your own adventure at Base Camp. Just step outside and down to your private dock jetting out over Caribou Lake. Bring your canoe, kayak, or motor boat with you and head out for a day on the lake. Fish are aplenty and the neighbors are friendly. Caribou Lake is a favorite amongst fisherman, canoers, and paddleboarders looking for a relaxing afternoon on the lake. Then when the sun goes down, light a fire in the outdoor fire ring, share stories and roast marshmallows with your friends and family. 4-Wheel Drive Vehicle is Recommended. House is very clean and comfortable. Deck and view are fantastic. Carabou lake does not have a lot of cabins so during the week it is very quiet and wonderful to kayak. Location for hiking is excellent. Great lakeside location. Caribu Lake is great for canoeing or kayaking. Saw eagles, ducks, and deer. Beautiful for stargazing at night. Lots of short hikes available in the area, several with amazing waterfalls. Comfortable beds. Great shower. Beautiful deck and large fire pit. Excellent as a "Base Camp" for exploring the North Shore/Grand Marais.